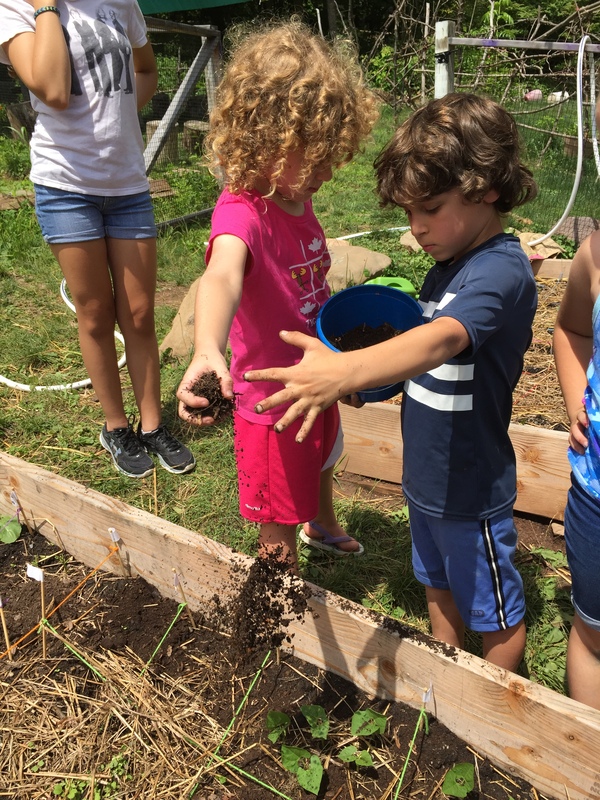 Summer Play at Blue Rock School− Where Special Friends and Lasting Memories are Made! Kids from Group C show off flags they made. It’s Week 2 at Blue Rock Camp, and everything is in full swing. The kids are developing friendships and getting to know (and love) their counselors. We are all enjoying the continued lovely weather. Some days were misty and magical, perfect for exploring the woods, and some were hot & muggy pool days. The kids from Group C have been enjoying caring for our visiting chickens, brought in by group leader Shannon who raised them from babies. We’re seeing a lot of happy faces as the kids begin to unwind from the school year and really get into summer mode. Here’s a peek at what we’ve been up to this week. In the art room, we finished up our second week of the pottery intensive. 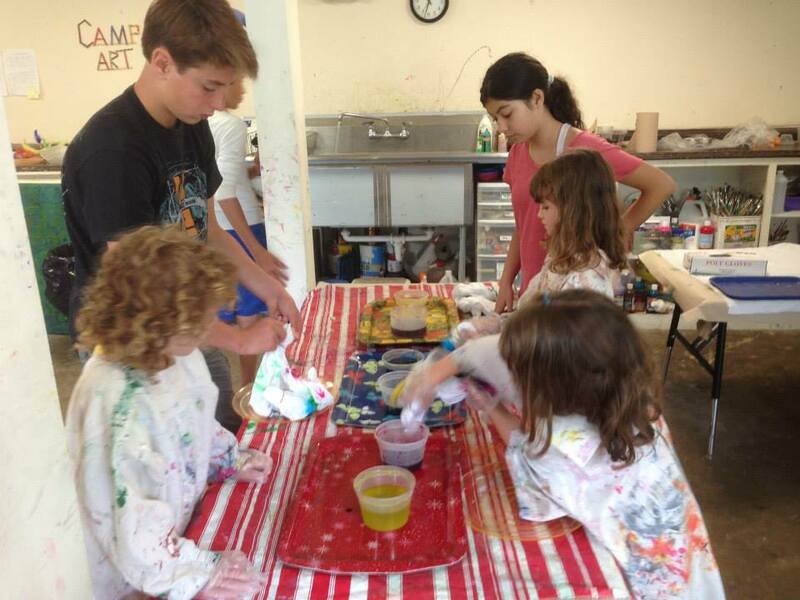 The older campers glazed their projects fired from the week before, and worked on smaller pieces. We did a nature walk and collected items to press into clay slabs for texture. These were then used to make wall pockets. We used acrylic paint to paint some of the smaller clay fired pieces, and also painted tiles. The littlest campers created a long, collaborative, additive sculpture that we put in the garden by the art room. We finished this week with our tradition of tie-dying camp tee shirts, always a big hit. Here are instructions for washing out the shirts when they come home with your campers. 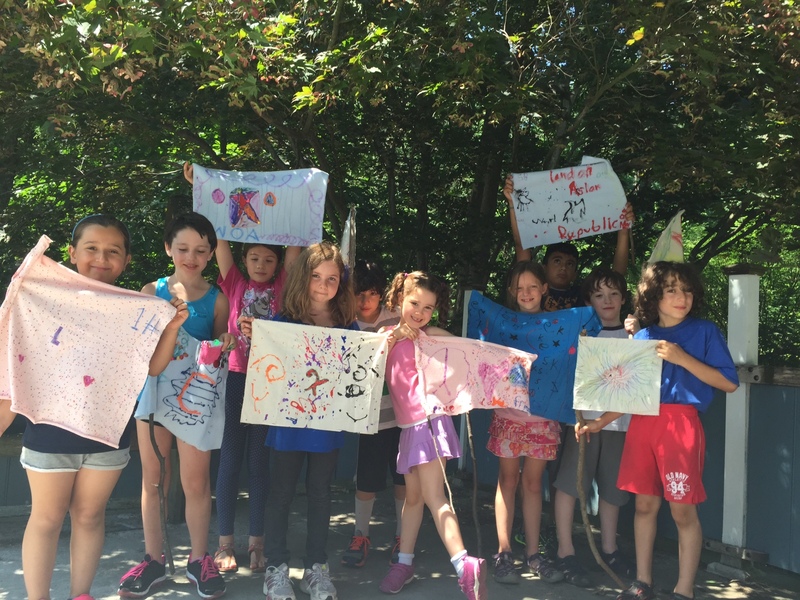 One of our campers, Lily, also led a group in homemade making sidewalk chalk. There was quite a flurry of creative activity in woodworking this week. Some kids began creating flower presses, which when finished will allow them to preserve collected plants and flowers. We also worked together to build a large Earth Loom, which you may notice by the building near the drop off circle. 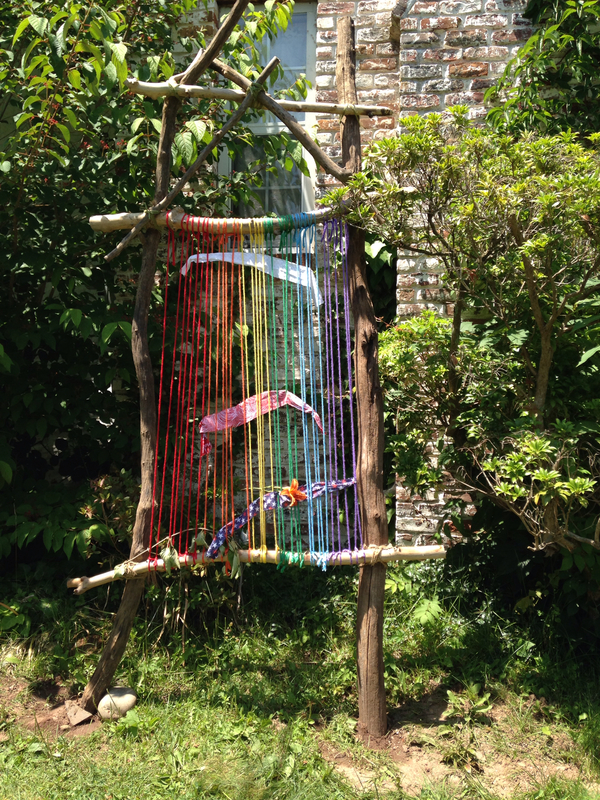 We lashed together branches to create a frame and added colorful yarn. Throughout the summer, campers can weave branches, flowers, cuttings from the garden, ribbons, and strips of fabric into the loom. It’s an ever-changing record of our summer together. Kids also made fairy houses, board games, twig cabins, and funny wooden faces. We had a special visit this week from Steve, the grandfather of one of our campers. He helped kids string together wind chimes out of bits of pipe and scrap wood. The end-of-camp play is a beloved Blue Rock tradition. 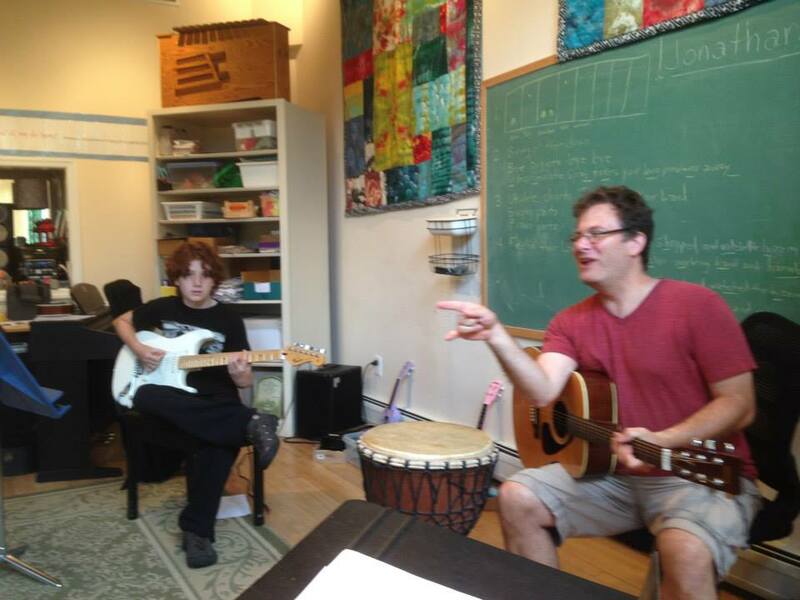 Mary Esther and Johnathan started work on this year’s production with the kids this week. Blue Rock Camp plays are special: They are always designed so that kids can participate at whatever level they’re comfortable with, without the pressure or anxiety some kids feel when faced with performing. It’s a gentle, joyful introduction to drama. Johnathan ironed out the music and lyrics this week, while Mary Esther worked on the story with lots of input from the campers. You may hear the kids humming or singing the tunes as they begin to learn them. 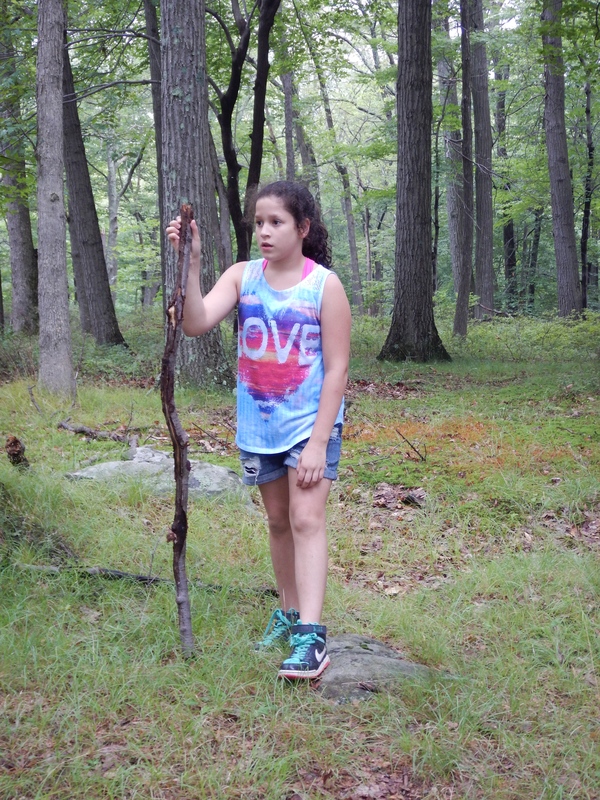 At Blue Rock, our older campers go on excursions where they experience the natural world outside our campus. This week, our excursion leader Katie (who’s also our woodworking faciliator) brought the kids to Lake Tiorati in Harriman State Park. The weather was a little cooler than we’d hoped for, but most of the kids decided to swim in the lake anyway. William was excited to catch a small fish with one of our small nets, and we found snail shells in all shapes and sizes. After drying off and warming up during lunch, we set off on a hike. Near the lake was an trail head for a section of The Appalachian Trail. As we made our way there, we talked about how the AT is one of the longest marked paths in the world, running all the way from Georgia to Maine. We saw a group of AT backpackers, and the kids high-fived them as they passed. As soon as we walked onto the trail, we knew we were in a magical place. Huge boulders covered with moss, ancient trees, and feathery ferns surrounded us. The misty weather added to the sense of peace and mystery. Some kids at the front of our group were lucky to see a doe before she bounded away into the woods. We stopped when we noticed a huge stand of wild blueberry bushes. It’s a bit early for blueberries, but on close inspection we found many ripe blue ones hidden among the immature greens. Once they got the thumbs up from Katie on the berries’ safety, the kids happily foraged around and ate what berries they could find. We are thinking about going back to our new blueberry treasure trove in a few weeks to see if we can catch them at their peak. Head frog wrangler at Tarrytown Nature Club and Wilderness Program Coordinator at Summer Play at Blue Rock. This entry was posted in Camp Newsletter and tagged Art, Music, Nature, Newsletter, Play, Pool, Science, Woodworking. Bookmark the permalink.